AWS Aurora is a relational database engine that combines the speed and reliability of high-end commercial databases with the simplicity and cost-effectiveness of open source databases. Aurora PostgreSQL delivers up to 3x performance of PostgreSQL. 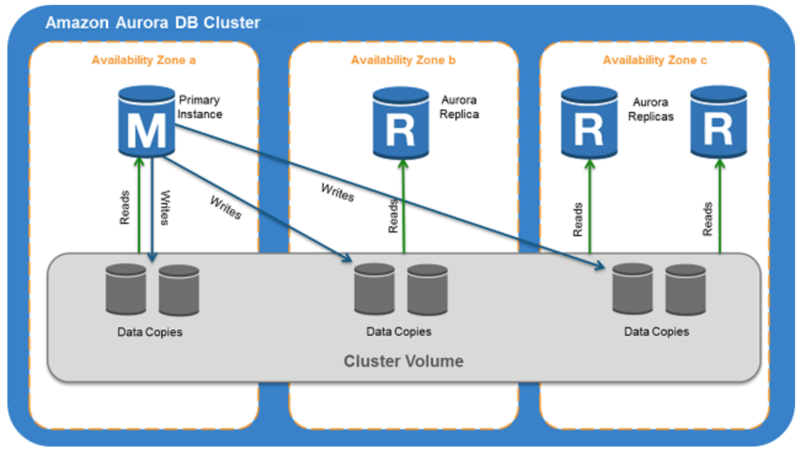 RDS manages the Aurora databases, handling time-consuming tasks such as provisioning, patching, backup, recovery, failure detection and repair. NOTE – AWS Aurora is covered in the latest Solution Architect – Associate Feb 2018 extensively, so be sure to cover the same. Aurora automatically divides the database volume into 10GB segments spread across many disks. Aurora storage is also self-healing. Data blocks and disks are continuously scanned for errors and repaired automatically. Any Aurora Replica can be promoted to become primary without any data loss and therefore can be used for enhancing fault tolerance in the event of a primary DB Instance failure. To increase database availability, 1 to 15 replicas can be created in any of 3 AZs, and RDS will automatically include them in failover primary selection in the event of a database outage. Aurora allows database encryption using keys managed through AWS Key Management Service (KMS). Encryption and decryption are handled seamlessly. With Aurora encryption, data stored at rest in the underlying storage is encrypted, as are its automated backups, snapshots, and replicas in the same cluster. Automated backups are always enabled on Aurora DB Instances. Backups do not impact database performance. Aurora automatically maintains 6 copies of your data across 3 AZs and will automatically attempt to recover your database in a healthy AZ with no data loss. point-in-time restore operation can be performed to a new instance. Latest restorable time for a point-in-time restore operation can be up to 5 minutes in the past. Deleting Aurora database deletes all the automated backups (with an option to create a final snapshot), but would not remove the manual snapshots. Company wants to use MySQL compatible relational database with greater performance. Which AWS service can be used? An application requires a highly available relational database with an initial storage capacity of 8 TB. The database will grow by 8 GB every day. To support expected traffic, at least eight read replicas will be required to handle database reads. Which option will meet these requirements? 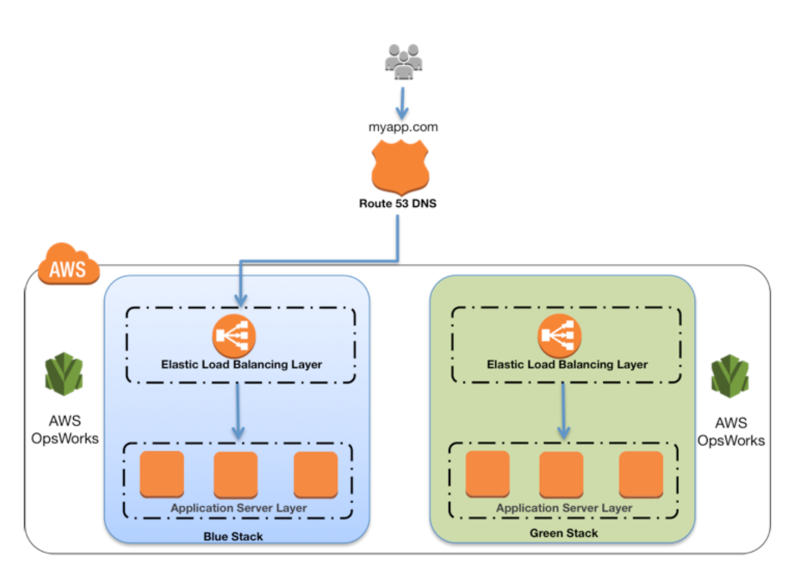 A company is migrating their on-premise 10TB MySQL database to AWS. As a compliance requirement, the company wants to have the data replicated across three availability zones. Which Amazon RDS engine meets the above business requirement? X-Ray provides an end-to-end view of requests as they travel through the application, and shows a map of the application’s underlying components. X-Ray helps to understand how the application and its underlying services are performing to identify and troubleshoot the root cause of performance issues and errors. X-Ray to analyze both applications in development and in production, from simple three-tier applications to complex microservices applications consisting of thousands of services. X-Ray can be used with distributed applications of any size to trace and debug both synchronous requests and asynchronous events. Trace data sent to X-Ray is generally available for retrieval and filtering within 30 seconds of it being received by the service. X-Ray stores trace data for the last 30 days. This enables you to query trace data going back 30 days. X-Ray integrates with applications running on EC2, ECS, Lambda, and Elastic Beanstalk. X-Ray SDK provides add-ons for MySQL and PostgreSQL drivers. For Elastic Beanstalk, include the language-specific X-Ray libraries in your application code. An X-Ray trace is a set of data points that share the same trace ID. Piece of information relayed by each service in the application to X-Ray is a segment, and a trace is a collection of segments. Annotation is associated with a segment and a segment can contain multiple annotations. X-Ray errors are system annotations associated with a segment for a call that results in an error response. Error includes the error message, stack trace, and any additional information for e.g, version to associate the error with a source file. X-Ray should not be used as an audit or compliance tool because it does not guarantee data completeness. X-Ray agent helps collect data from log files and sends them to the X-Ray service for aggregation, analysis, and storage. Agent is available for Amazon Linux AMI, Red Hat Enterprise Linux (RHEL), and Windows Server 2012 R2 or later operating systems. DynamoDB supports Local and Global Secondary Indexes. Read replicas are updated asynchronously as DynamoDB acknowledges a write operation as successful once it has been accepted by the master table. The write will then be propagated to each replica with a slight delay. Efficient disaster recovery, in case a data center failure occurs. Faster reads, for customers in multiple regions by delivering data faster by reading a DynamoDB table from the closest AWS data center. Easier traffic management, to distribute the read workload across tables and thereby consume less read capacity in the master table. Storage for the replica tables. Reading data from DynamoDB Streams to keep the tables in sync. Cost of EC2 instances provisioned, depending upon the instance types and region, to host the replication process. DynamoDB Global Tables is a new multi-master, cross-region replication capability of DynamoDB to support data access locality and regional fault tolerance for database workloads. Applications can now perform reads and writes to DynamoDB in AWS regions around the world, with changes in any region propagated to every region where a table is replicated. Global Tables help in building applications to advantage of data locality to reduce overall latency. Custom logic for a DynamoDB trigger is stored in an AWS Lambda function as code. A trigger for a given table can be created by associating an AWS Lambda function to the stream (via DynamoDB Streams) on a table. When the table is updated, the updates are published to DynamoDB Streams. In turn, AWS Lambda reads the updates from the associated stream and executes the code in the function. DynamoDB Accelerator (DAX) is a fully managed, highly available, in-memory cache for DynamoDB that delivers up to a 10x performance improvement – from milliseconds to microseconds – even at millions of requests per second. DAX does all the heavy lifting required to add in-memory acceleration to the tables, without requiring developers to manage cache invalidation, data population, or cluster management. DAX is fault-tolerant and scalable. VPC endpoints for DynamoDB improve privacy and security, especially those dealing with sensitive workloads with compliance and audit requirements, by enabling private access to DynamoDB from within a VPC without the need for an internet gateway or NAT gateway. VPC endpoints for DynamoDB support IAM policies to simplify DynamoDB access control, where access can be restricted to a specific VPC endpoint. 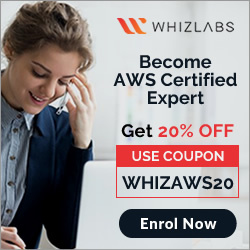 AWS Organizations is an account management service that enables consolidating multiple AWS accounts into an organization that can be created and centrally managed. AWS Organizations includes consolidated billing and account management capabilities that enable one to better meet the budgetary, security, and compliance needs of your business. As an administrator of an organization, new accounts can be created in an organization and invite existing accounts to join the organization. Consolidated billing is a feature of AWS Organizations. Master account of the organization can be used to consolidate and pay for all member accounts. Accounts can be grouped into organizational units (OUs) and each OU can be attached different access policies. OUs can also be nested to a depth of five levels, providing flexibility in how you structure your account groups. Organization permissions overrule account permissions. This restriction even overrides the administrators of member accounts in the organization. When AWS Organizations blocks access to a service or API action for a member account, a user or role in that account can’t access any prohibited service or API action, even if an administrator of a member account explicitly grants such permissions in an IAM policy. IAM provides granular control over users and roles in individual accounts. User can access only what is allowed by both the AWS Organizations policies and IAM policies. Resulting permissions are the logical intersection of what is allowed by AWS Organizations at the account level, and what permissions are explicitly granted by IAM at the user or role level within that account. If either blocks an operation, the user can’t access that operation. Select AWS services can be enabled to access accounts in the organization and perform actions on the resources in the accounts. 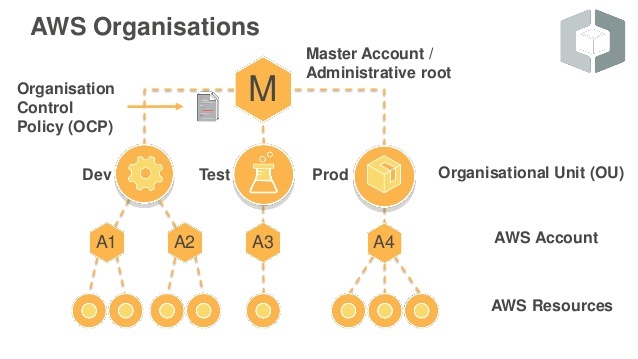 When another service is configured and authorized to access with the organization, AWS Organizations creates an IAM service-linked role for that service in each member account. AWS Organizations is eventually consistent. AWS Organizations achieves high availability by replicating data across multiple servers in AWS data centers within its region. If a request to change some data is successful, the change is committed and safely stored. However, the change must then be replicated across the multiple servers. An entity created to consolidate AWS accounts. An organization has one master account along with zero or more member accounts. Parent container for all the accounts for the organization. Policy applied to the root is applied to all the organizational units (OUs) and accounts in the organization. A container for accounts within a root. An OU also can contain other OUs, enabling hierarchy creation that resembles an upside-down tree, with a root at the top and branches of OUs that reach down, ending in accounts that are the leaves of the tree. An OU can have exactly one parent, and currently each account can be a member of exactly one OU. A standard AWS account that contains AWS resources. Each account can be directly in the root, or placed in one of the OUs in the hierarchy. Policy can be attached to an account to apply controls to only that one account. Accounts can be organized in a hierarchical, tree-like structure with a root at the top and organizational units nested under the root. can create new accounts in the organization, invite existing accounts, remove accounts, manage invitations, apply policies to entities within the organization. has the responsibilities of a payer account and is responsible for paying all charges that are accrued by the member accounts. Rest of the accounts within the organization are member accounts. An account can be a member of only one organization at a time. Process of asking another account to join an organization. An invitation can be issued only by the organization’s master account and is extended to either the account ID or the email address that is associated with the invited account. Invited account becomes a member account in the organization, after it accepts the invitation. Invitations work by accounts exchanging handshakes. Primary use in AWS Organizations is to serve as the underlying implementation for invitations. Handshake messages are passed between and responded to by the handshake initiator (master account) and the recipient (member account) in such a way that it ensures that both parties always know what the current status is. includes advanced features that gives more control over accounts in the organization. master account can apply SCPs to restrict the services and actions that users (including the root user) and roles in an account can access, and it can prevent member accounts from leaving the organization. Service control policy specifies the services and actions that users and roles can use in the accounts that the SCP affects. SCPs are similar to IAM permission policies except that they don’t grant any permissions. SCPs are filters that allow only the specified services and actions to be used in affected accounts. SCPs override IAM permission policy. So even if a user is granted full administrator permissions with an IAM permission policy, any access that is not explicitly allowed or that is explicitly denied by the SCPs affecting that account is blocked. For e.g., if you assign an SCP that allows only database service access to your “database” account, then any user, group, or role in that account is denied access to any other service’s operations. Master account of the organization is not affected by any SCPs that are attached either to it or to any root or OU the master account might be in. Whitelisting and blacklisting are complementary techniques used to apply SCPs to filter the permissions available to accounts. Explicitly specify the access that is allowed. All other access is implicitly blocked. By default, all permissions are whitelisted. AWS Organizations attaches an AWS managed policy called FullAWSAccess to all roots, OUs, and accounts, which ensures building of the organizations. For restricting permissions, replace the FullAWSAccess policy with one that allows only the more limited, desired set of permissions. Users and roles in the affected accounts can then exercise only that level of access, even if their IAM policies allow all actions. If you replace the default policy on the root, all accounts in the organization are affected by the restrictions. You can’t add them back at a lower level in the hierarchy because an SCP never grants permissions; it only filters them. Default behavior of AWS Organizations. Explicitly specify the access that is not allowed. Explicit deny of a service action overrides any allow of that action. 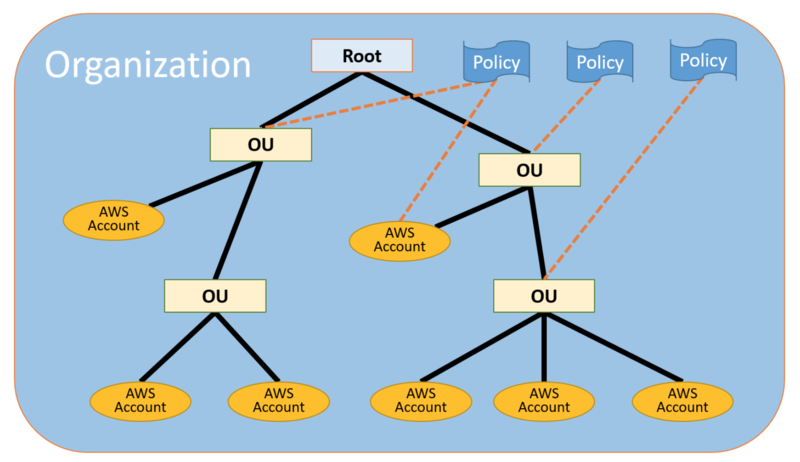 By default, AWS Organizations attaches an AWS managed policy called FullAWSAccess to all roots, OUs, and accounts. This allows any account to access any service or operation with no AWS Organizations–imposed restrictions. An organization that is currently using consolidated billing has recently acquired another company that already has a number of AWS accounts. How could an Administrator ensure that all AWS accounts, from both the existing company and the acquired company, are billed to a single account? Merge the two companies, AWS accounts by going to the AWS console and selecting the “Merge accounts” option. Invite the acquired company’s AWS account to join the existing company’s organization using AWS Organizations. Migrate all AWS resources from the acquired company’s AWS account to the master payer account of the existing company. Create a new AWS account and set it up as the master payer. Move the AWS resources from both the existing and acquired companies’ AWS accounts to the new account. 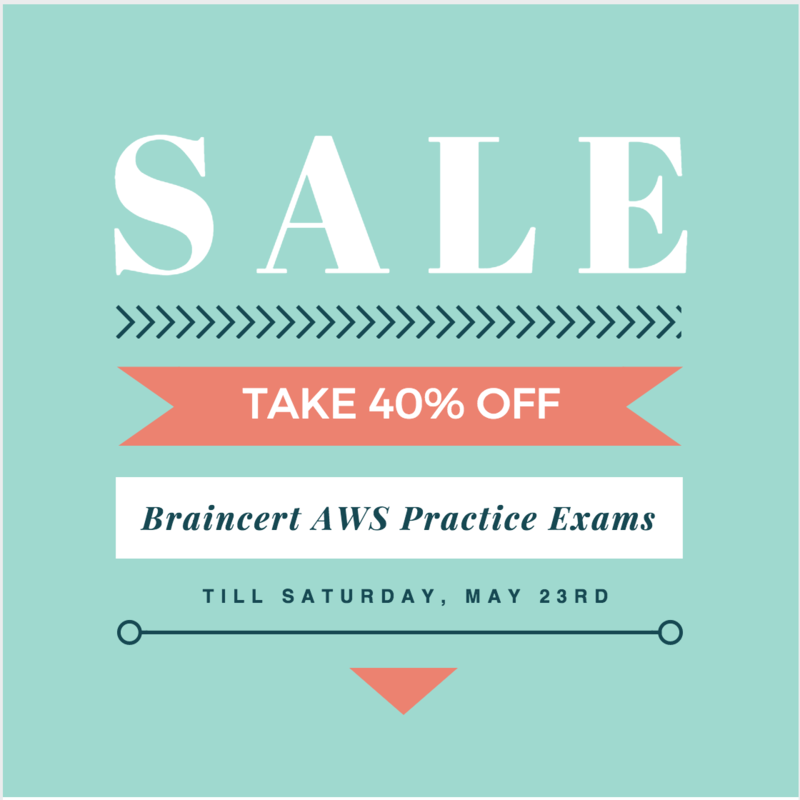 Centrally manage access polices across multiple AWS accounts. Automate AWS account creation and management. Analyze cost across all multiple AWS accounts. Provide technical help (by AWS) for issues in your AWS account. A company has several departments with separate AWS accounts. Which feature would allow the company to enable consolidate billing? During a rolling deployment, part of the instances serve requests with the old version of the application, while instances in completed batches serve other requests with the new version. When processing a batch, detaches all instances in the batch from the load balancer, deploys the new application version, and then reattaches the instances. After reattaching the instances in a batch to the load balancer, ELB waits until they pass a minimum number of health checks (the Healthy check count threshold value), and then starts routing traffic to them. Elastic Beanstalk waits until all instances in a batch are healthy before moving on to the next batch. When all instances in the batch pass enough health checks to be considered healthy by ELB, the batch is complete. If a batch of instances does not become healthy within the command timeout, the deployment fails. 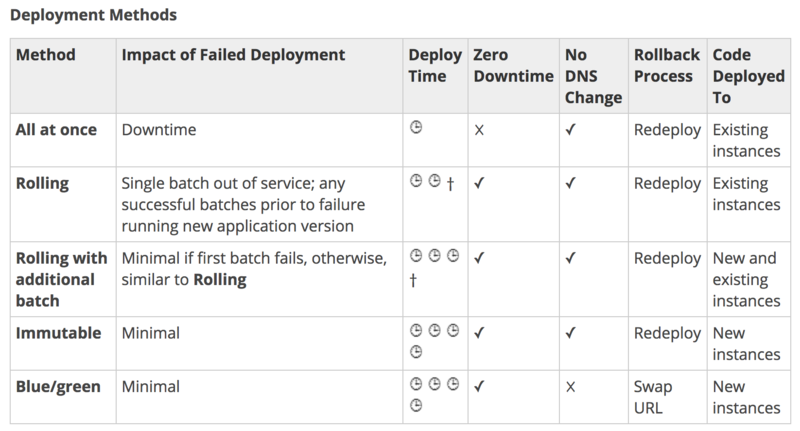 If a deployment fails after one or more batches completed successfully, the completed batches run the new version of the application while any pending batches continue to run the old version. If the instances are terminated from the failed deployment, Elastic Beanstalk replaces them with instances running the application version from the most recent successful deployment. When the deployment completes, Elastic Beanstalk terminates the additional batch of instances. All at Once and Rolling deployment method updates existing instances. If you need to ensure the application source is always deployed to new instances, instead of updating existing instances, environment can be configured to use immutable updates for deployments. 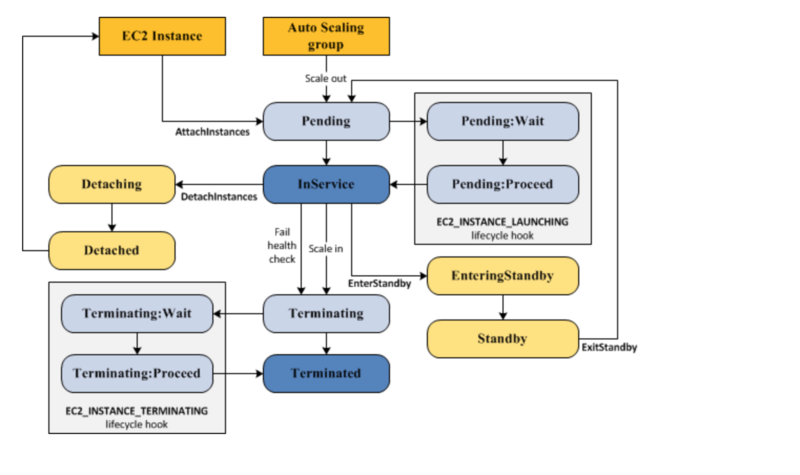 Immutable updates are performed by launching a second Auto Scaling group is launched in the environment and the new version serves traffic alongside the old version until the new instances pass health checks. Immutable deployments can prevent issues caused by partially completed rolling deployments. If the new instances don’t pass health checks, Elastic Beanstalk terminates them, leaving the original instances untouched. Blue Green deployment entails a DNS change and hence do not terminate the old environment until the DNS changes have been propagated and the old DNS records expire. DNS servers do not necessarily clear old records from their cache based on the time to live (TTL) you set on the DNS records. Enable rolling updates in the Elastic Beanstalk environment, setting an appropriate pause time for application startup. Create a second Elastic Beanstalk environment running the new application version, and swap the environment CNAMEs. Develop the application to poll for a new application version in your code repository; download and install to each running Elastic Beanstalk instance. Create a second Elastic Beanstalk environment with the new application version, and configure the old environment to redirect clients, using the HTTP 301 response code, to the new environment.